Steven (Chicagoland, United States) on 17 November 2010 in Architecture and Portfolio. 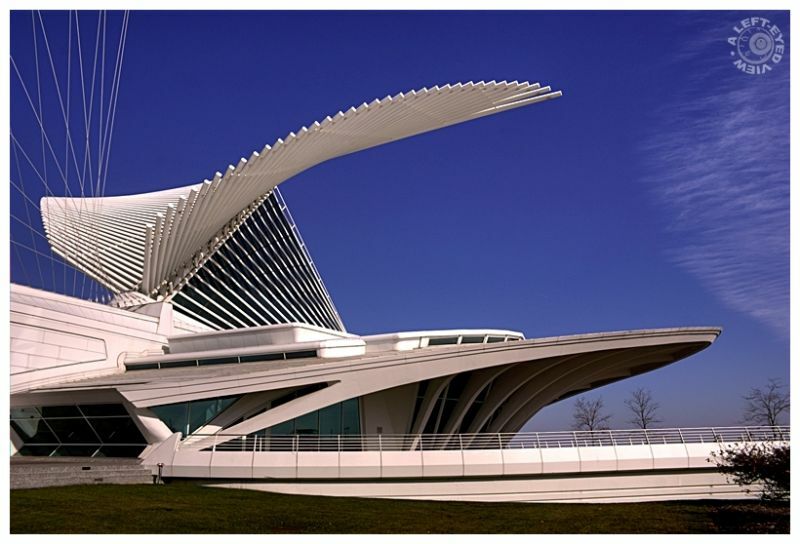 Exterior of the Milwaukee Art Museum as seen from its southwest side, looking northeast. The Burke Brise Soleil is a moveable, wing-like sunscreen that rests on top of the Museum’s vaulted, glass-enclosed Windhover Hall. The “wings” open Tuesday – Sunday at 10 AM with the Museum, close/reopen at noon, and close again with the Museum at 5 PM; except on Thursdays when the Museum closes at 8 PM. While the Burke Brise Soleil has a wingspan comparable to that of a Boeing 747, its two ultrasonic wind sensors automatically close the wings if the wind speed reaches 23 MPH or greater. Unlike the airplane, the Museum prefers to remain on the ground. Superb shot of this modern architecture.. lovely curves, lines and beautiful sky. This building has amazing shape and beauty - still looks like a ship. You've got that eye for those graphics, this is very well captured, great work. Wonderful architecture. What a shape ! What a truly amaziong story Steven! Thank you...now I MUST go here someday...add it to the bucket list. I can see why the views from the inside are so dramatic....I am sure they have heard LOTS of stories about Scotty yelling "I'm given' her all she can take, Captain!" SO I won't say that! It does kinda' look like a starship. @vu@granby - Wolfgang: Me, too. And I'd probably try to catch a time lapse of the brise-soleil opening and closing. :-) Not until I posted this photo did I realize that the brise-soleil opened and closed at specific times of the day. Strewth . . now, that's what I calls impressive ! Cracking shot, too, Steven. It definitely looks like it wants to fly! A beautiful image of this unique building. Just like an aerial sculpture. even more stunning than the image of two days later! what an interesting and intriguing concept! i, too, would love to see the sail closed!